Opening Reception: Tuesday, November 22nd from 6 – 8 p.m.
NEW YORK – The work of Adam Straus, spanning a three and a half decade career, will be on view at Nohra Haime Gallery and Adelson Galleries from November 22 – December 24, 2016. The two exhibitions at 730 Fifth Avenue will showcase paintings, works on paper, sculpture, and photography. 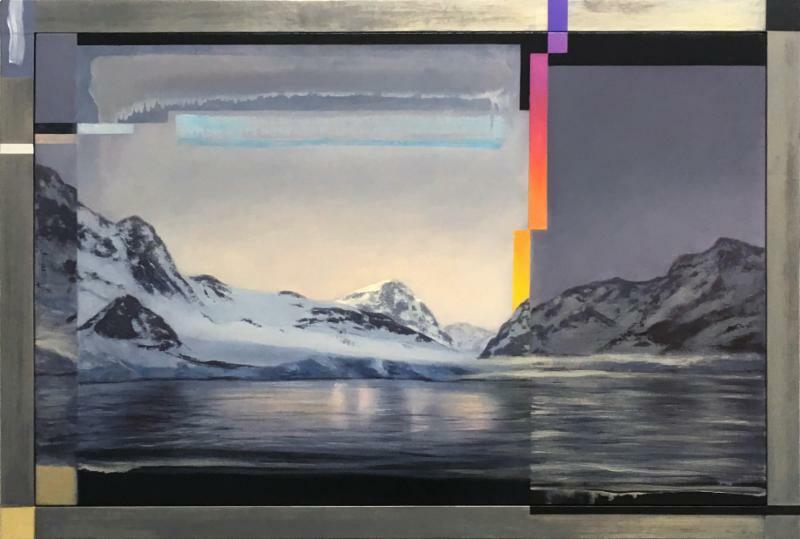 Straus is known for his majestic and luminous depictions of the sublime, which are often saturated with a deep concern about social and environmental issues. His penetrating dark humor can transport the viewer to post-apocalyptic worlds and often offers a wry observation on how humans have altered the natural landscape. The exhibitions coincide with the publication of a new monograph (Gli Ori, Italy, November 2016). An opening reception will be held on Tuesday, November 22, from 6-8 p.m.
With more than 40 works, the exhibition at Nohra Haime Gallery will survey Straus’s oeuvre from 1979 to 2016. While the focus will be on paintings and works on paper, Straus’s little-known photography and sculpture from the early 1980s will provide context for his later transition to painting. A number of the works are from private collections and will be on public view for the first time. At Adelson Galleries, the exhibition will focus on 14 paintings on canvas and works on paper from 2011 to 2016, many of which, in a witty and irreverent manner, refer to how technology alters our view of nature. Straus’s cinematic expanses are sometimes painted on jute, which provides a rough surface that softens the image and creates the look of a screen. A 2000 painting framed in lead, A Line Drawn in the Sand, depicts a vast desert stretching out to a blue sky with a line scratched in the middle. As Straus writes in the book, “It was inspired by the bellicose comments by so many of the politicians in the ’90s about the Middle East…They would say ‘We really have to draw a line in the sand,’ as if that really was a strategy.” Painted the same year, Toxic Run-Off: The Calm Before the Storm was inspired by the 19th-century American Luminist and Hudson River School painters such as John Kensett and William Trost Richards. Framed in lead with the paint dripping out of the picture, the peaceful seascape is both alluring and disturbing. In mid-2016, Straus began working on a series of paintings entitled Glitch, which will be on view at Adelson Galleries. Using an app that “glitches” up a photograph of one of his paintings, Straus would repaint a scene with abstract imagery based on the patterns created by the Glitch app. His subject matter, cold and remote regions of the world including icebergs in Antarctica, is inaccessible to most people, and therefore there are few eyewitness to the devastation caused by climate change. A new monograph on the work of Adam Straus will be published by Gli Ori, Italy, in November 2016. The book will include text by Adam Straus, edited with an essay by Amei Wallach, the award-winning filmmaker, art critic, journalist, and curator. Straus writes about childhood experiences, fascinating moments with collectors (one revealed that President George W. Bush shed a tear in front of one of Straus’s painting about 9/11) and how a move to the North Fork of Long Island from Brooklyn in 2003 inspired many of his works. Work by Adam Straus is in numerous museum collections including the Parrish Art Museum, Bridgehampton, NY; List Visual Center, M.I.T., Cambridge, MA; Butler Institute of American Art, Youngstown, OH; The Art Museum at F.I.U., Miami, FL; Mead Art Museum, Amherst, MA; Tufts University Art Gallery, Somerville, MA; and the William College Museum of Art, Williamstown, MA, among others. Born in Miami in 1956, Straus lives and works in Riverhead, NY. OPENING: Tuesday, November 22nd from 6 to 8 p.m.